JEAS is devoted to publishing cutting edge social science on East and Southeast Asia. The journal is interested in work that combines theory, novel empirical contributions and engagement with the major substantive issues facing the region. The JEAS publishes primarily in the fields of international relations, including both international political economy and security studies, and comparative politics. However, we welcome interdisciplinary work and contributions from sociology, applied economics and business studies as well. The journal is also open to roundtables on important new books on the region, review essays and shorter research notes. SSCI indexed, the journal prides itself on a strong peer-review process.For more information on submissions and subscriptions, visit the website at Cambridge University Press. The resilience of authoritarian regimes rests on a combination of repression and responsiveness. In the lead article to the latest issue of the Journal of East Asian Studies, Xingmiu Liao and Wen-Hsuan Tsai draw on a unique dataset of irregular petitions to suggest how the government makes this tradeoff. The authors show that during important political meetings, when petitioners seek to cast the spotlight on government abuses, local governments tend to deploy “hard” measures to counter these petitions, including sending petitioners home and even detention. Yet in political off-seasons, the administrations are more likely to use “soft power,” including persuasion or even tacit negotiation. Their contribution deepens our understanding of the repertoire of instruments the Chinese government uses for maintaining social control. Guangdon Xu, Wenming Xu and Binwei Gu also address an important issue for the Chinese government: the management of environmental issues. Using a stock market event study design, the authors show that the establishment of the ministry did in fact signal a new approach, as listed firms in polluting industries experienced a statistically significant shock to share prices around the event date. They also show the value of state connections as state-owned enterprises experienced less negative abnormal returns than private ones. The use of such event studies is not straightforward and in a productive exchange Deborah Selighson engages with the authors on the exogeneity of the event and whether their inferences are warranted. The debate casts light not only on the specific issue at hand—whether markets see new regulatory powers as mattering—but on the methodological issue of what we can learn from event studies of this sort. The new issue continues our tradition of publishing high-quality work on Southeast Asia with a contribution by Ari Pradhanawati, George Towar Ikbal Tawakkal and Andrew D. Garner on vote buying in Indonesia. In many vote buying arrangements, politicians cannot be altogether sure that voters vote as promised. Drawing on a tightly-designed local study on Java, they demonstrate that education matters. More educated voters are more likely to “vote their conscience” even if they are poor and most vulnerable to cash appeals. The JEAS welcomes well-designed qualitative analysis, and Fumi Ikeda provides an excellent example in a study of the role of unions in mobilizing votes in Japan. Ikeda starts with the puzzle that the Japanese Federation of Textil, Chemical, Food, Commercial Service and General Workers’ Union (UA Zensen) has a large membership but succeeds in mobilizing few votes. By contrast the Confederation of Japan Automobile Worker’s Unions (JAW) does much better although smaller in size. Ikeda argues that the difference lies in the density of union membership in company towns: autoworker unions are socially embedded in company towns that augment unions’ organizational capacity. Vote mobilization ultimately depends not just on parties and formal organizations, but on underlying economic and social organization. The role of the internet in politics has become a critical and controversial issue: does internet use strengthen political participation of various sorts or serve as a substitute for it? Shin Haeng Lee and King-wa Fu reach somewhat pessimistic conclusions: that internet use is associated with low-cost political activities like signing a petition and inclines respondents to more costly political actions like attending demonstrations or participating in protests. But this willingness to participate is not matched by actual participation, raising important questions about whether internet use can actually dampen contentious politics. Finally, Hojun Lee offers a deep dive into legislative procedure in the Korean National Assembly: the rules that serve to maintain party discipline. Lee shows that presidential politics served to weaken such discipline in a 2012 procedural reform bill. The reason is as follows: presidential candidates have interests which can vary—even sharply—from those of their party as they pursue their electoral ambitions. 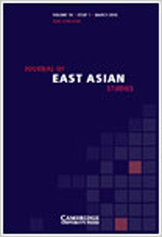 The Journal of East Asian Studies invites original contributions that meet the journal's aims and scope. or book reviews (1,000 words). Manuscripts for articles, review essays, and research notes should be submitted electronically, via the JEAS ScholarOne site. To submit an article, please visit https://mc.manuscriptcentral.com/joeas. British Columbia V6T 1Z1, Canada.Phone: 604-822-4358; fax: 604-822-5540; email: yvestibe@politics.ubc.ca.